Religious leaders are calling for calm among Birmingham's Muslims as police investigate an alleged kidnapping plot. Detectives have been granted more time to question nine men arrested on Wednesday on suspicion of planning to kidnap and murder a UK Muslim soldier. About 3,500 worshippers attended prayers at the city's Central Mosque. Chairman Dr Mohammed Naseem said Muslims felt "persecuted unjustly" by the government for political ends but urged them to control their anger. Speaking outside the mosque, he said the arrests were an example of the government justifying its political agenda. "They have invented this perception of a threat," he said. "To justify that, they have to maintain incidents to prove something is going on. "There is dismay and people feel they are being persecuted unjustly." Earlier, he told BBC News that people should stay calm. "The highest achievers are those who contain their anger," he said. 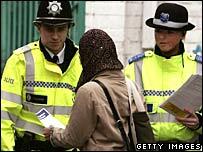 In the meantime, the West Midlands force has been trying to reassure Muslims that the arrests were targeted at criminals - not a particular faith or community. Some 5,000 leaflets translated from English into Punjabi, Hindi, Bengali and Urdu have been handed out explaining the operation and appealing for patience. The nine men were arrested under the Terrorism Act over what security sources say was a plan to film an execution-style murder of a British soldier and post it on the web. Police swooped on homes and commercial premises in Sparkhill, Alum Rock, Kingstanding and Edgbaston in a series of early morning raids, arresting eight men. Less than 12 hours later they arrested a ninth on a motorway in the Birmingham area. Since then, forensic teams have been combing all 12 addresses, as police question the men in an investigation they say could take "days, if not weeks". On Thursday, a district judge granted police a seven-day extension to continue interviewing the suspects. Under new terror laws, police can apply in court for a series of extensions up to 28 days. Are you a Muslim serving in the army? What impact has this story had on you and your community? Do you think recruitment into the army from Muslim communities could be affected? Tell us your thoughts and experiences by filling out the form below. Will the alleged terror plot stop Muslims joining the Army?